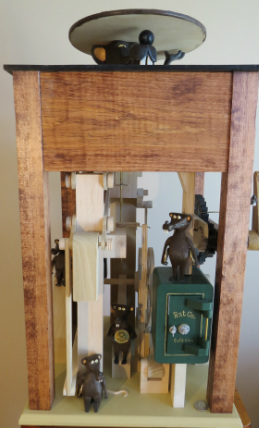 The Story of "Rat Co."
Rat Co. is a automata depiction of an underground rat run organization that retrieves coins from city streets to fund the development of buried infrastructure, which will ultimately result in more rat habitat. It is reminiscent of old fashion cast iron mechanical coin banks. The CEO of Rat Co., Norton pulls in coins off the pavement that fall directly into the company vault below. He achieved the position of CEO, largely due to his size. Few of his employees are in a position to challenge his authority. Size aside, Norton has connections on the streets and crossing him could lead to a pair of cement shoes! Several of the Rat Co. employees have shady connections to other clandestine organizations within the city. The Rat Co. employees busily manage the company's business of guarding, collecting, counting and distributing the booty. It is best to stay on their good side.